1. Why didn't I set my stop? 2. Why did I have such a far stop? 3. How do you set good stops? 4. Should I use a trailing stop? 5. Why didn't I see that pattern forming? 6. Why did I stay in that trade when it went against me? 7. Can someone make money trading? 8. It all looks so easy after the fact, but how do I know what direction it's going to take? 9. Why do I seem to always be going the wrong direction? 10. I do so well in practice, but can't seem to do it in real life. What's the issue? 1. Why didn't I set my stop? Perhaps you had "hope". I'm a woman of great faith, but in trading, even with my faith, "hope" rhymes with "dope". Don't be a dope. It is NEVER a good idea to trade on "hope". A part of good trading is managing your risk. Setting your stops IS a part of risk management, but not all of risk management. 2. Why did I have such a far stop? Placing stops is an art. Some people have a 10% or 15% rule. Others scalp or take so many points or ticks or dollars or whatever. As a trend trader, I set my based upon my trends, usually just within to take profits and just outside to take costs. Usually in greater timeframes (meaning if you trade 1 min., you will have stops closer than if you use a 30 min. chart). You have to be able to weather this, if you're a trend trader. 3. How do you set good stops? This is an art, like I said before. This is an acquired skill, which requires you to practice. It's advisable you practice in a real-time practice account instead of with real money. Get it down first and then use real money, small amounts. It doesn't matter if you have a large account or small, always start with very small amounts of money to trade. That way, if things go against you, you aren't as impacted. That is another thing in risk management, which is size of position. 4. Should I use a trailing stop? If you think the moves could be strong, I would use a trailing stop. It gives you the ability to take as much profits as you can, provided you have your trailing stops set correctly. I found the faster things move, the larger your trailing stop needs to be, as usually there are greater swings (greater volatility). 5. Why didn't I see that pattern forming? Look at the big picture by looking at various timeframes. Recognize what the different pattern formations are: wedges, pennants, rectangles, etc, for compression patterns. Then there are various candle patterns and trend patterns (head & shoulders, bear trap, batman, etc). It takes practice. Thinking that perhaps looking at a few charts or a few trades won't suffice. I've looked at tens of thousands. You gotta drill it into your head over and over until you can do it in your sleep. 6. Why did I stay in that trade when it went against me? Hope. Hope rhymes with dope. Instead, tell yourself you're an awesome trader that makes great decisions consistently and do those things that great traders do. They manage their risk, develop their skill, increase their knowledge, learn from every trade. 7. Can someone make money trading? You can make money at whatever you are good at, especially if you are passionate about it, this can fuel you to make great money. I'm working on the latter. Trading is probably one of the most challenging professions that anyone can do outside of parenting. Few survive. It's easy money if you remove all the roadblocks and obstacles. 8. It all looks so easy after the fact, but how do I know what direction it's going to take? The market will give you signs whether it is loading up to the up or downside. You have to be able to see these signals. This takes LOTS of practice. 9. Why do I seem to always be going the wrong direction? You're not paying attention to what the market is telling you either because you're not focused, don't have the big picture as well as small pictures, or you don't have enough skill or knowledge. 10. I do so well in practice, but can't seem to do it in real life. What's the issue? It's psychological and you're going to have to dig here. It may require professional help. It's alright. I see a therapist weekly to get these issues out in the open and deal with them constructively. Keep pressing forward. Gotta trade real money, but also know when you should not be. I would strongly encourage you to change some of the words you use: stink, stressors, needy, weigh on, compounded etc. Perhaps say, my attitude & outlook are areas God can use to grow me. Thank you God for entrusting to me so much to allow me to be in situations to challenge & grow my faith, and thank you that I can depend on you. What I do is I am careful about the words I speak and say to myself. Rarely do I use the words: tough, difficult, hard, impossible, try, dismal, can't, etc. Those all are disempowering words, words of defeat. Rather, choose words like: opportunity, challenge, adventure, victorious, overcomer, events, etc. If you read my gratitudes, you'll notice the words I choose usually are words of victory. I do probably slip up at times, but I've been way more aware the past few years about the words I use. "Pressures" or "events" are actually neutral. It is us that gives meaning to them that call them good or bad. What if you chose to let them remain neutral? For example, got an extra bill from the IRS that says you owe more money. We would deem that is "bad". However, is there something we can learn from that? Pay more taxes the next time? Do your taxes correctly? What caused the need to have to pay more? Does it necessarily mean you have to next time pay more in taxes, or be better informed as to how to make your money work better for you? This is uncomfortable to have this mode of thinking, but get excited for what you are learning from the "event" at what God is teaching you. Keep events that can be deemed as "bad" as neutral in terms of feelings & emotions as possible. Dominant energy wins. So, if you focal energies are towards negativity, this will dominate. However, if you begin to focus more on positive things, things of the supernatural, getting exciting about things God is doing, then you will begin attracting more of this in your life. I learned that at a Bible-based wealth building seminar I attended the end of January. Imagine that. 1% is this world, the natural. Hebrews it talks about Faith is the substance of things hoped for, the evidence of things unseen. What that means is that faith requires action and you are to step out in faith as if you already have what it is you are hoping for. Of course, we need to know what God's desire is for our lives. When our desires are in line with God's desires, then He is willing to give us our heart's desires. James talks about we don't have because we don't ask, and when we ask, we ask for things that God does not desire for our lives, wrong motives, etc. I'm not making tons of money in the market right now as I had envisioned, but I am making money. The stock market/trading has caused me to really seek God because any emotions/thoughts that throw my focus will and has impacted my trading. I'll trade, do okay, and then get hit with something and be blown away. Then, I have to analyze what happened. It's 100% of the time been psychological, at least the root cause. Right now I do not have a lot of money to trade with. I've used the majority of my money to get well emotionally/psychologically and to live, being wise with my money. It's caused me to address my relationship with money, fears I have, habits that are self-sabotaging, ungodly characteristics in me. However, I know God can take the small amounts I have an turn them into lots of money. The Bible talks about all sorts of people whom it was only because of Him that they were successful. When I reach that in my trading, it is because of God and His grace, His love & blessing. Just because I don't have right now does not mean I don't have His favor or blessing. On the contrary. I believe I am totally blessed & favored by God. However, there have been pride issues, fear, and a host of other ungodly things. God wants my whole heart, soul, mind and strength. He wants to be #1. If we look at our lives honestly, can we say He is #1? Most of us cannot say that, and there are days, God is fairly far from my mind, even though I do have a close walk with the Lord. What do I do to have the attitude of grace, joy and peace in my life? The mind is a battlefield. Take control of your thoughts. 1. Spend time daily in prayer, throughout the day. I talk to God throughout the day, in my head usually. I begin my days in prayer & song to the Lord while I'm lying there in bed, instead of doing my normal jump out of bed quickly. 2. Before I do any other things, I kneel beside my bed and open my Bible. Prior in prayer, I ask God to direct me to where I should go in the Bible and 100% of the time since Aug'08, right where I open the Bible and where my eyes fall, is where God wants me to be in His Word. Amazing. He speaks so intimately. I look forward to this time with Him. 3. I keep a journal in my Bible pack that keeps my Bible, pens, highlighter, notecards, and the journal. I journal succinctly (usually in point form) what God is speaking to me about, the things that really jump out at me. It's almost like another continuation of conversing with God, but this time He is speaking to me through the Bible. 4. Going through a 90-Day Proverbs 31 thing by Donna Partow. I spend time memorizing Proverbs 31:10-31, reading what she has for us to do. 5. #1-4 usually takes about an hour, maybe a little longer. 6. Subscribe to Joel O'Steens daily words of encouragement. I read these every morning and say the short prayer he has outloud. Sometimes I'll share this with the kids. 7. I'll begin writing out my gratitudes (that's why my lists are sometimes so long) in FB, save as draft until I'm ready to publish. 8. The past 3 school days, the kids and I have extra time so we begin reading. I'm starting today to read a children's Bible to my kids for 5-10 min. before school. 9. As we drive to school, we each do things we are thankful for. This morning it was 5 things, sometimes it's 10, other times 3, other times 20. It just depends. We say these things in excited voices. Afterwards, I will usually pray, but sometimes I have my kids pray, too. 10. When we get to school, and we're out of the car, I lay hands on my kids and declare God's favor & blessing upon each of my kids by name. I find this very important. 11. When I find myself irritated with some parent for some parking or driving thing at school, I can usually stop myself before I get into a complaining spirit and bless them instead, praying for them. 12. When I begin trading, I make sure I sit properly, drink water, have had a good breakfast, pray some more, turn on some classical music, and begin looking at my charts to see what they are saying. I only trade one thing, which is the ES (futures - S&P emini's). During trading, I often will spend time in the Bible & in prayer, also in worship. 13. When I pick my kids up, we also do more gratitudes. When I greet my kids, I am always excited to see them, give them hugs, kisses, encouragement. Well, more Sean than Hannalee because she doesn't want me to embarrass her among her classmates. I volunteer at their school 4 days a week after trading. 14. In the afternoons or evenings, I began playing the piano again, mainly worship music (Maranathal type) that sounds so beautiful. It really enriches my time with the Lord. Sometimes I will play in between trading. This helps me better develop the right side of my brain (the creative side). My left side (analytical) is highly developed. There needs to be better balance. 15. I will also play with my kids & their friends, read with my children, spend time with them. That nourishes my soul greatly, as well as my heart. We do not watch TV. Kids are encouraged to play outdoors, do creative things, read, study, play with their friends, etc. I am not big on having my kids sit in front of the computer or play video games either. 16. In the evenings, we read, pray, and do our gratitudes again. We basically as a family do gratitudes morning, afternoon, and evening. Sort of like Daniel praying, but with gratitudes. We also pray, too. And, I pray for all sorts of things whenever. My kids come to me often to pray for them, laying hands on all their booboos or their feelings, etc. 17. Usually by 9:30 pm, it's my goal to spend time with the Lord, sort of like I did in the morning, but more reflection of what's occurred during the day. Prayer time will be spent on my knees usually, kneeling before my bed. I'll also spend time in God's Word, and journal succinctly, review. Pray. This is about another hour. 18. My goal is to be in bed by 11 pm, to sleep from 11 pm to 5:30 am. That gives me 6.5 hrs. I do attempt to get to bed earlier, which often, I do. It's better for me to get 7+ hrs/day. 19. I make sure to eat nutritiously and healthy, organic, if possible. I do not eat much dairy or grains. Most of my diet consists of fibrous veggies, lean meats/poultry/wild fish, and Isagenix products. I do not drink caffeine and most days (like 99% of my days) I drink only water (other than my Isagenix shakes). I do not smoke, drink, or do drugs. 20. I do yoga 2-3 times a week, and I walk a few times a week. Right now, I have not been consistent with weightlifting. My exercise is moderate and doable for most people. Maintaining weight & bodyfat right now. By the time I'm done with the day, my personal time with God is usually more than 2.5 hrs a day. My goal was to tithe the gross hours God gives me. I used to only spend 5-10 min./day, but as I increased my giving time to God, that's what you're seeing the result of. My whole day is consumed with the presence and power of God, even amidst tears of pain, change, challenges. There may be sorrow in the evening, but joy comes in the morning. God is so very good, all the time. That is what most of my days are like. Weekends are similar, but there is more family time. I also attend a life group (small group at my church) once a week. Last Fall, I was in 2 life groups, but that's not something I can do this Spring. More of my time is spent at home with my kids. I go to church regularly, stay connected with people in my church and others, so as I'm not a lone wolf. There are a myriad of people I can lean on for support & encouragement in all areas of my life from children, to trading, to exercise, to eating, to relationships, to business, to organization, etc. It's important to have a bunch of different people to glean from. You each bring different value to the table. However, when I was not as well emotionally, I leaned on people A LOT, and now that I'm better, I just go to the Bible. It's alright. We each have different phases in our life. I used to write a lot more than I do now, but it's this season of action God wants from me right now, rather than just writing about it. It does no good to compare yourself to anyone else, including me. To get to where I am, it was baby steps and took so much time. I had lots of people holding my hands, and God carried me through most of it. The rest I limped along, sometimes fighting, screaming, kicking. But, now there is a surrendered heart, one that is willing to accept God's correction, discipline, and if it's neither of those, then to allow God to use me however He so deems. It's a process, a journey. Each of us have our unique journeys and cherish that. You are so loved by God. He has designed you perfectly and wonderfully. As I began to understand my Kingdom purpose, it makes it easier to trust God, even if the natural stuff happening says I cannot. About 3 weeks ago, I was challenged to step out of my comfort zone. Find 3 things not associated with trading that emotionally support me that gets me out of my comfort zone each day. I'm finding my trading is calmer overall, but it's also dredged up some nasty stuff that's been in my subconscious that is fighting to protect false beliefs/habits/mindsets. As you begin to address those things that are contrary to your success and the Word of God, the enemy and your subconscious programming will fight to keep those false beliefs & self-sabotaging habits in place. It won't be eliminated without a fight, so be aware. It may seem to get worse before better. But, keep persevering. Keep focused on Christ. Cling to His Word. Okay, you're probably wondering why this blog entry is entitled "Jesus", especially this is a trading blog. I'm well aware that my blog readers are a myriad of people of different beliefs & faith. But, since this is my blog, and those readers who remain readers & loyal to me, hopefully you recognize my faith in Jesus Christ is a very big part of my trading and my life. I'd really like to take this opportunity to share a little bit more about Jesus, other than my own daily walk with Him as I do in my life and share some of that with you. If you have asked Jesus to be your Savior, acknowledging you are a sinful person, that no one can save you from eternal death after this life except Jesus Christ. He is the only way to God. Asked God for forgiveness of your sins and receive His forgiveness through Jesus Christ, then you are as the Bible states, a Christian -- a Christ follower. Dear Lord Jesus, come into my heart. Forgive me of my sin. Wash me and cleanse me. Set me free. Jesus, thank You that You died for me. I believe that You are risen from the dead and that You're coming back again for me. Fill me with the Holy Spirit. Give me a passion for the lost, a hunger for the things of God and a holy boldness to preach the gospel of Jesus Christ. I'm saved; I'm born again, I'm forgiven and I'm on my way to Heaven because I have Jesus in my heart. That's it. It's really not a complicated thing and we often, as adults, make things so complicated. If you've said that prayer and meant it, send me an email or make a comment to this blog. I'd like to talk with you more if you have questions, or at the least, pray for you & celebrate. We all face obstacles in life, and I truly could not face what I'm facing without Jesus there to help me. He gets all the credit for giving me strength & courage to meet each day, especially when things are pretty challenging. I can truly say now I live most of my life without great worry, no matter what is happening, because the eyes I see with things are more the eyes seen through Jesus. Granted, it took me a long time to get to this point. God had to root out some nasty pride issues in my life. Praise be to God that He did. You don't have to go at life's issues alone. Jesus wants to walk with you each step of the way. My life isn't hunky dory, but I know what will happen to me after this life, and I have full confidence in what God is doing, even if things don't always look so great. Daily I can find multiple things to be thankful for, and usually it's quite easy, even on those really challenging days. God is good, all the time. God did not create my troubles. We live in a fallen, sinful world and He does allow things to happen. He gives people free will. Maybe it was not my freewill that caused some of my stuff, but someone else's freewill. But, this is still the consequence of sin that came from Adam/Eve that has been passed down through the generations. I know, not fair, but no one ever said life was fair. I want to bless your day, so if there is ever anything I can pray for you, my readers, about, feel free to comment or email me. I'd be happy to. Sometimes it may take me awhile to respond. Am working on that, but as everyone, I have to prioritize things in my life. For many people, stepping out of your comfort zone is very uncomfortable. Of course that is the case. That's why they call it out of your comfort zone. Duh. Sorry for the sarcasm. I honestly am not a sarcastic person these days, as there is some level of contempt and pride in sarcasm, and that's not what God desires of me. If I've written this before, please forgive me as I don't really remember what I wrote in this blog or somewhere else at times. But, if I do repeat myself, it's because I'm a mommy and that it bears repeating, at least as a reminder to me with the things I'm dealing in my own. Many of us want to be comfortable. But, frankly, that's a miserable existence to just be, without purpose, without drive, without that thing that makes you really want to live. Purpose and destiny are a great thing. They help propel you, give you meaning in your life. Even if you have everything in your life materially that you could want, humans are made to fulfill a purpose, a higher calling, to continually grow. When our vision for life stops, I believe that's when we die. A lot of people of all walks of life seem when they meet me, drawn to me, especially once they get to know me, and over a lifetime. Why is that? Other people, they truly avoid me at all costs, because I remind them of what they wished they had or could be, but do not have the courage of their convictions to face their own demons. So, if you're really reading my blog and find value from it, bless you. Hopefully something I write or do will stir something up in you to search for your own purpose, to get up and say there is more to life than just existing. I've lived my whole life with purpose, with gusto. Albeit sometimes, very misdirected with lots of mistakes, heartache, pain. Now, as I seek guidance from those who've made it before me, I'm learning that I do not have to experience every mistake, rather I am now becoming smarter to learn from others. But, it does not preclude me from experiencing pain in my own life, that turmoil that says to quit, that it's too hard, that no one else has done it, so why should I? If there are any 2 characteristics of my life that define me, they are purpose and indomitibility. I say that with great humility and meekness. My hope in Jesus Christ to be my strength has carried me through some pretty challenging times, including right now. You may not have a faith in Jesus, and with that I cannot speak, as I've had this faith since I was 7 yrs old, and it's only grown stronger and deeper as my life has progressed. On Feb. 6th, my wealth building coach challenged me to do 3 things out of my comfort zone that emotionally supported me that was not related to trading. Most days I find more than 3 things to do, and I can tell you, it's changing me. It's changing my trading. I'm able to risk differently, see things differently, feel differently. How many times can you use the word "differently" in one sentence? LOL. 1. I told a friend of mine that I loved him -- looked him right in the eyes and said it. Now, I tell quite a few people that I love them, but with him, we have a chasm between us that it was me crossing that chasm in a loving way to express love to a friend. Did this a few weeks ago and I still feel a bit awkward about it. 2. Laid on the floor face down in public for maybe 5-10 minutes crying, praying, singing. Pretty weird. 3. Slept on the opposite side of the bed. 4. Played the piano for the same friend I told that I loved. 5. Placed strict boundaries with my former spouse. 6. Left a couple voicemails of me playing the piano to a couple friends. 7. Danced crazy with a bunch of kids at my kids' school. 8. Shared about my financial situation with a few close people. 9. Allowed myself to cut loose during worship. 10. Raced my 5-yr old son at school (running). He beat me!! Eeek!!! My legs are way longer. 11. Kissed a friend (on the cheek) -- a different friend from #1. 12. Set better boundaries with certain people, to make sure there are no misunderstandings of where I stand on things, no matter how pushy they get. Get used to being uncomfortabe, because what makes you uncomfortable now that you are able to push past, you are progressing, maturing. There will be new things that make you feel uncomfortable, and so you keep moving forward, constantly changing, growing. It will open the doors for you to see things differently, more creatively, with newer energy. It will unlock doors that you never knew existed, allowing you to see the world differently, with greater opportunities. You can do this aggressively as you want, or take your sweet time, or do nothing at all. However, to live years without purpose or vision, it's quite sad. Maybe for some, it's too much work to live with purpose or vision. Well, hell yeah! It is work. You have to get out of your fricken comfort zone. I can taste what I want. I've sacrificed and put everything on the line to live this life. There is no plan B. Yes, I am Chinese and come from a traditional Chinese background. There is no Plan B, except to truly step out in faith in what God has called me to do and do it. Right now I'm gritting my teeth and hanging on for dear life. The ride is pretty intense, but it's also exciting because I get to see God at work. Man, God is so at work in my life. And, HE works inspite of my screwups. There are many. But, I get to see God's grace at work big time. As He imparts grace to me, it gently reminds me to have grace for others, especially when they hurt me deeply. Grace is undeserved favor. This is not to be mistaken for setting appropriate healthy boundaries with people. Anyway, I encourage you to step out of your comfort zone. Your trading will change. The very nature of trading, especially daytrading, is doing things out of your comfort zone. Something that I am really learning right now is that something only has power if you give it power. Personally, I rarely watch TV. In our household, we watch about 4 hrs max TV a month. Yes, you read that right. That is A MONTH, not in a day. I believe there are many things people can do that can entertain or stimulate their lives without the influence of TV. TV in it of itself is not evil. It's just this box in my living room. But, with the rise in obesity in children and just a bunch of fat, overweight adults in America, do we really need more sitting in front of the TV? I think not. As we turn on the TV, read the paper/internet, turn on the radio, it's all this doom and gloom about the economy. Do you want to turn your destiny over to the government to dictate whether you're going to be happy or not? If so, that's quite sad. We all have more power than we believe. I'm pretty sure of that because most of us have really distorted, faulty belief systems. I'm working to change my belief system and really step into the supernatural. This is not a spectator sport, but you actually have to take action, push past your fears or that sick to the stomach feeling that says you cannot go any further. This morning, I was super upset at my children, mainly my 5 yr old son for not helping me have this calm, creative, nice morning. Yesterday I wasn't trading, and he was perfect. Same with Sunday. However, just as I get ready to trade, he acts like some possessed person. That's just a fact of life. I allowed my little 5-yr old to have power, as I lost my temper. My anger was great on the drive to school, but I was able to ask myself, "Do I want to remain in this fury?" The answer was no. I began praying, asking God for forgiveness in my anger because I chose to let it get out of control and use some words that were not the best. Then, I asked my children for forgiveness, acknowledging mommy overreacted. By the time I got home, I was calm again. But, I figure what I needed to do was reset my mind on godly things, such as a godly attitude. Anger out of control is not good and is damaging. It invites things into one's life that are not good. I wanted to be sure to nip that in the bud very quickly, repent, rebuking any spirits that might be fed on that and asking for God's peace, favor to come in and reign. In the past, it would take me literally hours or days to get over things. Granted, my anger, compared to many people, is nothing, but as I grow closer in my walk with God, He prompts me fairly quickly if I get off the path I am to be on that I am in err and to get back on through acknowledgment, repentence and forgiveness. As some who have been following me for awhile, my separation & divorce was not pleasant and I continually will be dealing with my former spouse. That is also not a fun experience, but once again, a fact of MY life that I must contend with. So, I'm learning (and am given many opportunities weekly) to just laugh at my former spouses actions, words so that I do not give him anymore power than I have over all the years I did give him. It's actually lightened my load, spirit, and allowing me to think more clearly, enjoy life more. Don't give power to negative people or negative circumstances. Laugh at those things. Take actions to empower yourself, Stay away or minimize exposure to negative people, places, events, topics, media, music, etc. It isn't enough to just say positive things, but you must take actions, bring your emotions in line with your positive thoughts and TAKE ACTION. When you feel that fear or whatever rise up, keep pressing forward, because that begins to dissipate the fear. Believe me, I'm living it and I know. One day soon, I'll be able to write that I am a millionaire. Then a mega millionaire and that I've had a million dollar profitable day in the market, in fact, many million dollar days. This is just all a part of the journey. An old Chinese Proverb states, "A journey of a thousand miles begins with a single step." You have to keep taking those steps. You must act. No sitting on the sidelines. I cannot stress enough that it's important to not just use 1 timeframe, but to use a multiple of timeframes from macro to micro views. Sometimes people get so caught up in the minute details of where they are right now, but forget the big picture, then when something happens, they are totally baffled. Why did that happen? Is it because WalMart announced they missed earnings by 1 penny? Come on, get real, is WalMart going to move the WHOLE S&P 500 with missing by 1 penny? I highly doubt it. Especially if you are at a major pivot point. Do you think it could be testing that pivot point, seeing if they can find more sellers, especially if they cannot bring in buyers? Always be aware of the big picture. I go as far back to a monthly timeframe. Honestly, I find the monthly chart so incredibly beautiful, that to tell me the stock market is random is like saying the world is going to be invaded by aliens later this afternoon. As I've said previously, which also bears repeating (can you tell that I'm a mommy? ), the timeframes I use are 1, 3, 15, 60 minutes, daily and monthly. If I'm feeling really sharp and focused, I will trade off the 1 min. If I'm not quite all together there, I will use the 15 min. and maybe look for entries on the 3 min. You have to know where you are mentally, and if the results you have are showing that you're not doing so well, then increase your timeframe. No point in giving back to the market due to pride. Chuck the pride. Now that we have that settled, what am I looking for on the various timeframes? 1. Am I in overbought or oversold territory with RSI? 2. Am I nearing resistance or support on MACD? 3. What does the volume curve look like? 4. Where are the moving averages (in particular the 50 & 200 EMA)? Each of those questions have different answers in the various timeframes. You may be in oversold RSI = 15 on the 1 min. but maybe near RSI = 35 on the 3 min. and RSI = 45 on the 15 min. What does this mean? It means to expect a pullback on RSI on the 1 min., but you still have further it could drop. So, get in short at the pullback (often this might look like the stock pulls back to the 10 or 20 EMA on the 1 min. chart), as this will give you a better price, and then watch it drop. You can then, after it passes the point where some might consider a breakout, add to your position (legging into the trade). I don't prefer to do it this way, but you can. What this then does is pull RSI on the 3 and 15 min. lower (more on the 3 min. than 15 min.). You may find RSI = 15 on the 1 min. to be support. If you want to get out, you can, but if there is still room to move to the downside on the 3 and 15 min. and you don't want to be overtrading, then wait. The 3 min. will get to oversold before the 15 min., which will still give you more room to the downside. BUT, you have to pay attention to wear support is on the 3 and 15 min. charts for RSI. Let's say in the very near past (like the past few hours), RSI 3 min. found support at 20 and it's at 20 now, you might not want to take a position to the downside, as it usually bounces from here and moves up, even if for a retracement. Similarly if the 15 min. finds support at RSI = 25, then don't expect it to go to 15 as it did on the 1 min. The inverse would be true for being in overbought territory. This is only for RSI, but you can notice similar things in volume and MACD, and also price action. There are trends within trends within trends within trends. 1. Get enough sleep -- usually 7-8 hrs of good sleep. 2. Get the kids to sleep early so they get enough sleep. Have their school stuff packed, by the door, clothes out. 3. Wake up early (this requires going to bed early) around 5:30 am or so. 4. Spend time with God in prayer, reading/studying the Bible, listening to what He is saying to me. 5. Shower & dress. No staying in jammies. 6. Pack the kids' lunches before they get up. 7. Read some Joel O'Steen or something short that is positive, encouraging. 8. Get the kids up with a cheerful greeting, get their breakfast order. 9. Check the foreign markets & pre-market activity. 10. Make the kids' breakfast. Make my Isagenix shake. 11. Put on some positive praise/worship music or classical music. Nothing super rocky or upbeat, though. 12. Let the kids do their stuff, but keep track of time and maybe put on a trade, using trailing stops, in case I cannot be at my desk to manage things. 13. Take kids to school. Cleanup any dishes in the sink. Straighten/remove any clutter within eyesight of my desk. 14. Center myself, switch to only classical music in the background. Spend a few moments in the Bible, asking God to help me as I trade, for it is He that empowers me to create wealth. I may also spend some time (5-10 min.) playing the piano, to help me get some creative juices flowing. 15. Make sure I'm sitting correctly in my chair to get good flow and energy through my body. 16. Turn cell to silent. Turn my calendar on online, but to silent. Check my calendar to see what I have going on. 17. Clear my mind from distractions and begin looking at my charts, verbalizing what I see. 18. Drink a couple glasses of water and refill my glass with water. Those are the things I do typically before I get started trading that give me the best success. There is this art of trading, as I know some people will ask me, "How do you know which thing to use and when?" Honestly, I really don't know. When I'm really trading intuitively and doing it well, I'm able to see all these things on my chart and really just move to the rhythm and flow of what is happening. When I actually begin thinking too much, that's where I tend to have bigger costs or totally miss things. That would also go if I'm distracted. There are times I play connect the dots with my Swing Points (the highs/lows). Other times I'm using moving averages or fibonacci's. Most all the time I'm using RSI, and usually use volume. Sometimes I'll totally forget to consciously think about MACD, but I can see a pattern quickly (at a glance) that things are either weakening or strengthening. Intuitiveness is not "feelings" rather it's the mind's/subconscious' ability to process data and provide your body with feedback. I call this that gut reaction. Sometimes I am really in the flow of things, really seeing things in the market in a very uncanny way. Other times, I wonder if I should ever trade again. The latter is usually based upon distractions, negative thoughts, and just winging it. I am a big trend trader, but probably not as how other traders define this. In the strictest sense of this term, I am not, as I use a combination of things, which is my own blend of trading, but for all intensive purposes, I am a trend trader. Especially with RSI, I'm drawing my trends. For DOWNWARD action, connect the peaks. For UPWARD action, connect the valleys. I know, a picture is worth a thousand words and though I will not write a thousand words on this topic, I'm not feeling inclined to draw you a picture or give you a visual example, so you'll have to just bear with me, or move on, but I think these tidbits o information are worth it. - Look at various timeframes to see where you are in RSI. If you're already in very oversold territory, the likelihood of you staying in oversold lessens. - Usually the best time to get in bearish is when you have at least 2 peaks that are sloping downward. - If you choose to get in STILL to the downside after it's broken this trend line DOWN, this needs to be for a brief period of time, because it's a matter of time it reverses. Quickly take profits or set closer stops to avoid bigger costs. - Extend trend line to above 70, closer to the 90-100 range. - If line is broken by price action moving downward, you can wait as often it tests that trend line, but if it moves downward strongly, you need to get out. - The rest is the same but the reciprocal for bullish as bearish. - What if price action is going sideways? Usually RSI will have at least a slight bias towards either the bearish or bullish. Look at the peaks and valleys. Are the peaks getting lower or higher as price action moves forward? If they are getting higher, then that is more bullish. If they are going lower, then it's bearish. Similar with valleys. Lower valleys signify bearish. High valleys signal bullish. - What does volume say? - Notice very slight differences. Let's say RSI peak = 69.71 and the next one is RSI peak = 69.53. That is LOWER, so tending towards bearish. - RSI can go into compression patterns like wedges, pennants, rectangles, etc. Often breakouts ARE tested, but once it fails or pasts the test, go in whatever direction it goes in. I use Trade Navigator Gold as my trading platform & charting tool. I have my screen that has all 4 of these panes as one complete chart. 1. I rarely use the BB or Para Sars, except maybe as short-term stops. 2. I will often use the moving averages as stops or entry points, as well as the pivots. No one gave me this complete setup, but this setup took me months to come up with. I collaborated with a couple other traders who use the same platform as me, and took what resonated with me -- personality, goals, temperament. Originally I just used price action with the moving averages, but found I wasn't getting it correct as much. At that time I was just a trend trader and found I kept getting whipsawed and it wasn't working for a highly volatile market. A trader friend of mine told me that he uses the 50 and 200 EMA on the ES and it works super well, so I added these to my chart. I originally had the 10, 20 and 100 SMA, but found as I changed to EMA (S = simple, E = exponential), this worked far better. I wanted closer stops and was used to using the 10 & 20 from a previous instructor who used these and liked them. I eliminated the 100 SMA and have tested the 10, 20, 50 & 200 EMA and found this combination works super well for me. However, this wasn't enough to help me to read the markets enough. That same trader said volume is a big indicator. When he said that, I didn't really understand what he meant. Then, I hired my 2nd trading coach for a 3 month period and he explained the volume thing to me. My first trading coach whom I totally love and was with for 1.5 yrs or something like that, wasn't big into looking intently at volume. My 2nd trading coach said it's a huge indicator that is NOT dependent upon price and tells you a whole lot. As he explained and I began to catch on, it all made sense. The rest of the indicators are based off of price, but volume is independent of price, so it made it a great leading indicator. Could someone trade using just price action? Absolutely. What about price, moving averages and volume? Yes, of course. However, I wanted greater accuracy in what I was reading. I have another trader friend that swore by RSI. So, my 2nd trading coach began explaining RSI and the theory of trading relativity to me. I latched onto this greatly and began even some thoughts on my own here. I was told that usually most indicators are lagging, but found depending on how you use the indicator, it can be lagging, but can also be leading. In this case with RSI, I found the way I began using it, it was a leading indicator, so I incorporated my version here. Things were fine & dandy with 3 panes: price action, RSI, and volume. However, a different friend said he found MACD was great. I'm thinking, ONE MORE indicator? You've got to be kidding! He said to try it, and I backtested it probably at least a thousand trades before putting it on my charts. 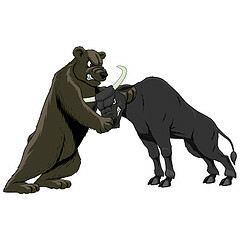 It was a great indicator to see when bullish & bearish action was strengthening and/or weakening. Why use so many things? Isn't it just all clutter? Since I've now done tens of thousands of trades using this setup, it's not a big deal and each indicator tells me something different, whether it's a confirmation or not of what I'm seeing. If RSI, Volume and price action all match, but MACD doesn't, then it means the strength of the move is less. When they are all saying the same thing, that's when the move is the strongest. The more you have saying the same thing, the better it is. Does it mean if you have 2 saying one thing and the other 2 not, does that mean you are not to get into the trade? No, but it does mean trade with caution. You may want to set your stops closer or further away, depending on your risk tolerance. The swing points I added probably as my last thing. This basically gives me the high & lows. How it calculates it, I don't know. I used the settings my trader friend gave me and it seems to work really well for my setup. Some people use a RSI setting of 14. I tend to like it a bit faster and did not like it at 14 at all. That setting did not resonate with how I traded and seemed to have less % of profitable trades. I also attempted various settings for MACD, but this also decreased my profitable ratio, as well as smaller profitable trades. The combination I have for my setup if adhered to strictly, will give 80-90% consistently profitable trades, as well as keep your costing trades to a minimum when you have them. This is just my setup. My trading strategy is additional, and I'm not going to copy that here, but will give you the reader some homework to figure out what works for you. Although I was an engineer for 1.5 decades, I honestly do not care for formulas or calculations. I'm really more a visual, artistic type. If formulas float your boat, have at it. There are formulas to calculate the pivots. Great. I'm not going to punch these numbers into a spreadsheet or calculator. That does not work for me, though, I could do it. However, what works for me is to look to the left to see what has been done. 1. Where did it rally? This would be a good entry LONG (calls). 2. Where did it bump its head at resistance? This would be a good entry SHORT (puts). I want you to keep in mind, relative. Everything is relative. What timeframe (s) are you using? The shorter your timeframes, then you want to look for areas of rallies & resistances that are closer. If you have longer timeframes, those shorter rallies & resistances will not apply. So, you will have to set your stops accordingly. Even if you're on a short timeframe, it's always advisable to take note of longer timeframes to see what the other pivots are, in case it blows through the pivots you have. Take note of what is happening as it nears those pivots. 1. Is volume starting to dry up? 2. Is the price action volatility decreasing? 3. Are you seeing more doji's? 4. Do you see longer wicks (areas of testing)? 5. Where are you on RSI (is it in overbought or oversold territory?)? 6. Are you near a moving average (I use the 10, 20, 50, 200 EMA on all timeframes)? These are questions you need to ask yourself. Of course, if you trade a barchart rather than a candlestick, you won't be asking about the doji's. Pivots are areas where they see if they can bring more buyers in (if they are moving to the upside) or more sellers in (if they are moving to the downside). If they cannot, they will begin reversing the direction. I'm going to take a few short posts that help me greatly in my trading that I hope give you insights in your trading. Test out what I say. I've said some of this before, and yes, I could draw diagrams, or input charts, but that would take more time than I'm willing to invest and would probably not write at all. So, you're going to have to pick apart what I say and draw this out for yourself. First of all, everything is relative. Take for example on the 3 min. chart, everything is relative. Stuff that's happening in the past 5-10 or so candles compare those to the prior 5-10 candles. When I throw out 5-10 candles, this could be the past 30 candles. Whatever. Everything I'm saying is relative and you have to gauge for the situation you are in. 1. Ask yourself, is the trend of this rising price action stronger than what is happening to the bearish side? 2. Let's say you have rising price action with rising bullish volume, but the bullish volume candles are short, while the bearish volume candles near it are significantly bigger. What does this tell you? This tells you that bullishness is WEAK. There is a greater tendency towards bearishness, so be careful. 3. Just because you may have rising price action with rising bullish volume, draw some lines on your volume and see if the actual trend is strong. Compare it to the things that most happened recently. If you're looking at the past 30 min., maybe look at the last 2-3 hrs. What do these volume candles tell you in comparison to the past 2-3 hrs? Are these candles shorter, the same, or taller? The bigger the candles, the greater the strength of the movement. 4. Just because you have one big candle does not mean it's a trend. Is there a progressively stronger trend of significantly greater bullish volumes, and does this exceed recent prior volumes? 1. Note that the look of this is different for bearish than for bullish. 2. The rest of the stuff is similar to Bullish, but where you have "Rising Price", you would replace for "Falling Price"
3. Remember to keep everything relative. Especially during times of what seems like INDECISION (Doji's), the big guys already know which direction they are taking things. Look very carefully at volumes, which will often be very subtle. Those volume bars will be very short, but you will begin to see the big guys either slowly dumping or loading up on positions. Go to the bars to see if you actually have rising or falling volumes and of which type (bearish or bullish). Sometimes it is so subtle, one can barely see on the chart, and I have to actually look at the actual volume for each candle to see what is happening, even on my 22" monitor, because sometimes the volume bars look almost even/flush. I've even seen sometimes it maybe as little as 50-100 contracts of increasing to one side or the other, so I'll begin doing what the big guys do, and sure enough, it's correct. There will be times though, they will be either loading up or dumping, but the price action will be contradictory. This is what I call a headfake, where they attempt to shake out all the people in the opposite direction they really intend to take things, so you have to be able to weather this, especially if you're in for a longer timeframe. Once again, longer timeframe is relative. If you trade the 1 min. timeframe, 3 min. is longer or 15 min. is a lot longer. These guidelines work, at least as far as I've tested through thousands of trades, for all timeframes from minutes to months. BTW, I've not used the tick method, so if you use this, then this may or may not apply, but I would think it would. This has happened to me on more than one occasion and bears repeating, if nothing as a reminder to myself. The market is always right. My opinion doesn't count for jacksh**. I have no impact or bearing on the market whatsoever, so to think my stops get taken out because some market maker is out to get me is absolutely absurb. As those who have been my readers for awhile, you know I love the bearish side of the market. Not quite sure, but maybe it's vindication for those years I had absolutely no clue that you could make money going to the downside, as well as to the upside. Direction of the market is neither good, nor bad in it of itself. People assign meanings to those directions. If the market is going down and your position needs it to go up. That isn't such a good thing. Vice versa also. The thing is to understand the signals the market is giving you and go with the flow, let the "gorilla", which is the market, lead in this dance. Sometimes the cues are incredibly subtle, other times it's in your face. Whatever it is, the market is right, even if it makes no sense to you what it's doing. It's our jobs as traders to better understand the cues of the market to know when we are in a retracement or when an actual reversal is happening. Often I will have a bias towards the down side of the market just because it's fun for me when the market tanks and I can get a piece of the action. Albeit, I haven't developed enough skill for when things move quickly to consistently take a piece of the pie without getting myself reemed in some manner. Sometimes the moves will be quick, strong, and a lot and I may just get a nibble. Other times, it was by accident that I had a trailing stop and it just went with it. And, still, many times, I just miss the move all together as I sit here watching in shock and dismay that so many points can be moved in such a short amount of time and quickly calculating my "what if" scenario. "What if" doesn't pay the bills, neither does virtual money, only cold hard trading and cash. As I write this, the market is slowly moving up and it's a few minutes pre-market. Could it be moving up or is this just a retracement? It's really to let the market tell me and not for me to wish that it would tank to 777 or 740 or whatever the numbers I desire. Keep the attitude that whatever the market does, it's perfectly fine and wonderful and I just want to go peacefully join in it, tagging along. So much has transpired with my thoughts, feelings, emotions about things over these past few weeks and too many things to write about. I know. It's not really helping my readers over the past 3 weeks. Please bear with me. I feel like I'm on the verge of making some really big breakthroughs. It's not just having an "aha" moment, rather it's taking that "aha" moment and integrating those breakthroughs into my life. Pushing through things. There are so many thoughts and things I'm learning right now. My time is limited as I'm spending more time doing, rather than just writing about it or just introspectively reflecting. It continues to elude me as to how some can spend so much time writing and on their elaborate blogs. I wonder if there is a team of people they have working for them coming up with stuff or they do it all on their own. Especially those with families of young children. How do they do it? My kids take a lot of time and I do spend a lot of time with them, playing, doing homework, teaching moments, and a range of other things. That's why my trading is down to one thing now -- the ES, and I have ONE strategy that can be applied to any timeframe and works very well, with a high degree of profitability. However, all the technical skill is worth jack if you cannot execute properly. As I analyze my trades after the fact, I notice often there is self doubt. Literally now for 3 months I haven't completely broken through trading 1 contract at a time. Why is that? I've proven my strategy works when I follow it, so then, why do I not consistently follow it? If the strategy works, then why not consistently increase the size of my positions (increase the number of contracts). That would stand to reason, right? But, underlying all this, there is still an element of fear, or scarcity or something. THAT'S what I've been working on. You have tangible results of what you truly believe. A person will be able to tell what you truly believe by the hard evidence. Okay, I'm a good trader, but the reality is, does my belief system support that? Surely at the level that I'm at, all the time, effort, knowledge, skill, risk management, I can consistently take on bigger positions, right? It doesn't mean I'm to bet the whole farm or do stupid risk management, but honestly, many days I could really take on bigger positions and thereby increase my portfolio at a much quicker rate. Do I truly believe I can become a millionaire? Are there elements of truly being successful where there is fear involved? Do I believe I can easily make lots of money on a consistent basis? Why is it so easy for me to consistently make lots of money every day in the stock market and keep it? Why do I joyfully and easily see opportunities all around me and seize the right opportunities to empower & enrich the lives of my family & I quickly with boldness & confidence? The lists can go on and on. So, I've been wrestling with all these things, absorbing myself in a lot of soul & heart searching. I've had a number of people identify that I think too much. Granted, I have a mind and I ought to use it, but where matters of the heart are concerned, there is the need to lead with my heart rather than my head, as my heart is always right. The heart does not necessarily mean emotions or feelings, rather it is that gut level instinct, the intuitive side (as I understand it) that processes information on a subconscious level, that is correct. It sees into the supernatural realm. I've had a lot of shifts on how I view and deal with my former spouse. That's a big wowzer. I've also been using a lot of Carol Look's materials that I've collected over the past few years. I have 44.5 hrs of EFT (emotional freedom technique) stuff that I'm going to go through. Some I have before, but I figure over the next couple months, I'd like to go over all this material, as she's the EFT practitioner that most resonates with me. She does a lot of work on abundance, prosperity type stuff. EFT is an energy psychology method and you can google her. She has a lot of great material. I'm seeing a lot of unhealthy habits being broken. I'm thinking I should've done all this stuff when I originally got the stuff, but I wasn't ready for it. Now I am. I really want to see my trading really take off, meaning, get to millionaire and multi-millionaire status THIS year. There is no reason why it cannot, except for hanging onto false beliefs, mindsets that hold me back. How much I'll share here, not sure, as I'm really doing the stuff. I'll keep you apprised. My trading continues to get better incrementally, but I'd like to see it take off exponentially to the upside, so I'm addressing the factor that is critical here -- the psychological factor. Stayed tuned for more in the weeks to come. I know my readers are probably wondering what's been happening to me. Yes, I've been intermittently trading daily, but really doing a lot of life stuff. In the middle of all my tax stuff, though, I've handed my stuff over to the CPA to address, especially the stuff that I've been behind on, finally. Hopefully he'll be done this week, or at most, next week, then get onto business there. I've also been doing a lot of financial organization, and still have areas to organize of my business & personal stuff that is paperwork. The inclination is to complain, whine here, but I really don't want to give that area of my life energy to get bigger, rather I want to focus my energies on what I want to happen. There is really a lot for me to write about, but I didn't sleep much last night, so I'm going back to bed for 3 hrs, then wake up to trade. My priority right now is not my blog, but to have better organization in my finances, paperwork, so this will allow me greater success overall in my trading. God cannot entrust to me more money if I cannot properly manage what He's given me, and that includes paperwork. It's irrelevent whether I enjoy doing this or not, rather it is a part of where I want to go, so these things must be done. Until it's in my budget to hire a bookkeeper to do all this, it's up to me to address. I am working with a wealth building coach who is challenging me to step out of my comfort zone daily in things that would make me feel good and emotionally support me. Living in chaos is not support of me emotionally and really is quite crippling. As I tackled some major things over the weekend, it's helped me greatly to feel better. Today, I will do more paperwork organization. My home still seems too cluttered, and I may decide to put some of my books for sale up on half.com. Not sure, as this takes time that I do not have. Anyway, I've been living life, getting things done, addressing things God is bringing up to me to address, destroying false beliefs and replacing with God's Truth. I'm making huge strides the past 2 weeks. Ironically, I haven't been blogging too much in any of my blogs. When will I begin posting my results again? I have no set date, now, but hopefully soon. I'm still making good progress, but I really want my trading to take off exponentially to the profitable side. It seems I've been hanging here where it's been moderately comfortable for quite some time, and I really want to take off, reach millionaire status. I'm still pretty far off from this. My wealth coach is helping me to break through this resistance, so I've got to be very persistent. It means actually pushing past what's comfortable, getting used to embracing the pain, and really going for it. It leaves less time for blogging. If I was getting paid to blog, perhaps I would be doing it more, but right now, this is more a luxury and I have to focus on the things that are going to get me tangible results. When time permits, I'll share more of this journey, but there has been so much. I would challenge my readers, though, to really dissect your beliefs. Are your beliefs congruent with your thoughts. If you say you want financial prosperity & to be a millionaire, are you actively taking positive steps towards this? If not, then re-evaluate your beliefs, because there are probably some things you're believing that are false, because you always have tangible results from your beliefs. We operate from our subconscious, which are those habitual things. Change your subconscious and that will change your beliefs. That's why I do not really want to focus on the negative things as that does not add, rather takes away from my life. My goal is not to do "venting", rather "redirecting". It's not to ignore the negative emotions, rather to acknowledge they exist, but to give them no power, no fuel. Another apology. I thought I would be able to hit the ground running Monday morning trading, as I got back from a very intense, but amazing conference from Friday-Sunday. However, just as I was getting ready to trade, something major happened that was not a pleasant experience that caused me to put trading on hold for Monday and Tuesday so I can attend to personal things. Not that those things are taken care of, but right now, it is in the hands of another, and I am waiting for that person to respond back to me. Hopefully it will be sometime next week, which will give me time to get back into trading. I met some incredible people at the conference, and though they are not traders, they are Christians who are strong in their faith, as well as have big dreams, goals in terms of financial prosperity-wealth. They will be a part of my mastermind team so that we can build a network of likemindedness in reaching our goals. Going to bed shortly so I can get enough rest to trade tomorrow. I will not be going back to last week's stuff as that's just too much catching up for me. By the end of the week, I ended positive in all my accounts, but it was an erratic week of trading for me as I had too much on my plate of stuff going on. This week, I'll start from from Wednesday forward.